Abstract: This concise and accessible resource provides an overview of the fundamentals of teaching in early childhood settings (pre-K–2), with a focus on what high-quality practices look like. 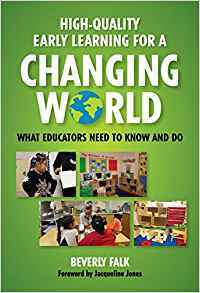 It details the features of developmentally appropriate, linguistically responsive, culturally relevant/sustaining teaching and how this approach can prepare our youngest citizens for the challenges of our 21st-century world. Beginning with what the research tells us about how young children develop and learn, Falk shows how to create learning environments, plan, teach, and assess in ways that support children’s optimal development. Specific strategies are described and explained, such as setting up the classroom environment and schedule, making smooth transitions, using effective communication strategies, and creating home–school partnerships.